Niagara Falls, ON - The St. Elijah the Prophet parish in Niagara Falls, Ontario is specific according to many things. It was founded a little over two years by faithful Orthodox Christians from the Niagara Falls region who didn't want their church to be anything more than a place of religious worship. 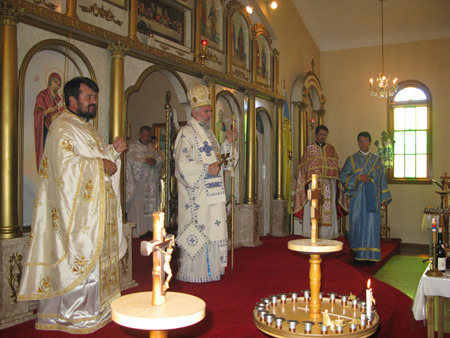 Since for many years they didn't have a place to pray to God they requested of His Grace Bishop Georgije of Canada to allow them to found a new parish. Understanding their desires Bishop Georgije founded the parish which he dedicated to the Holy Prophet Elijah, of the greatest zealous prophets of the Old Testament. 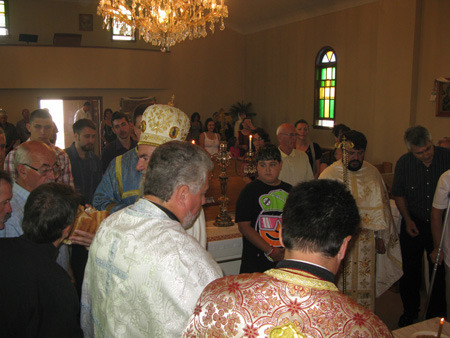 This was the second year this parish celebrated their Church Slava and it was the reason for the bishop's archpastoral visit during which he officiated at the Holy Hieararchical Divine Liturgy with the concelebration of diocesan clergy: V. Rev. Prvoslav Puric, V. Rev. Milojko Dimitric, Deacon Damjan Radojcic and the local clergy Protonamesnik Dusan Gnjatic. With their singing, Fr. 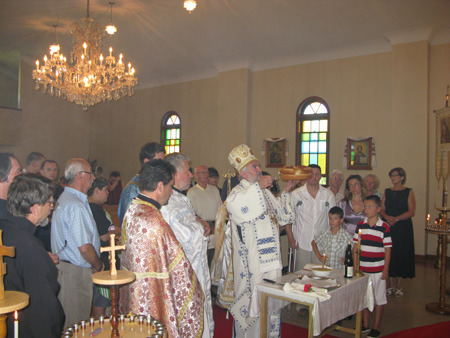 Milenko Zec and the monk Dimitrije, completed the liturgy after which the Slava Kolach was cut with this year's kumovi Borislav Zivkovic, church baord president, and his family. Accepting the kum position for next year was Miodrag Aleksic from Niagara Falls. Bishop Georgije addressed the faithful at the end of the liturgy with a short homily. He spoke of the Prophet Elijah, his faith and zeal in defending the truth of the one God. He emphasized the prophets rather unbalanced battle with pagan priests but with the help of the Almighty God he didn't surrender and was therefore rewarded. He also mentioned that we musn't be afraid for all things are possible with God, but to remain firm and steadfast in our longing for a place of prayer. Following the liturgy a rich Slava meal was prepared by our Kolo Sestara in the church hall. Afterward, the church board president Borislav Zivkovic thanked Bishop Georgije, the clergy and all of those who found the time to come to church and enrich our celebration. 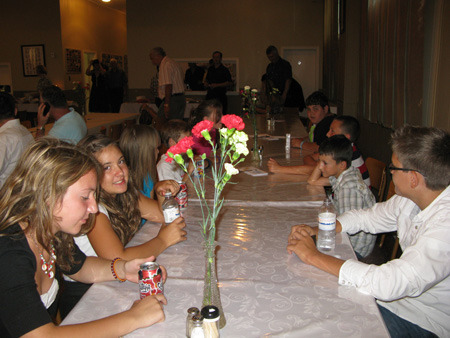 Borislav emphasized that the parish, regardless of the difficulties it faces, is becoming stronger and more stable and he proudly noted that besides everything else that was done in the parish, there were also four baptisms. He especially thanked Fr. Dusan for his many efforts in making this parish stronger in numbers each day. Fr. Dusan thanked the church board president as well as all the members of the board and stated that it was truly a joy to work with them. He thanked all of those who found the time to attend the Slava celebration, though it is a working day as well as a time of vacation. Fr. Dusan then invited Bishop Georgije to once again say a few words that through his teaching he might pave the way to the Lord, which Bishop Georgije did do the delight of all in attendance.